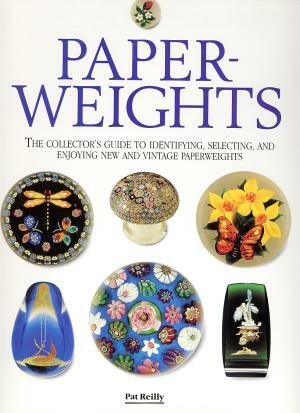 This is a delightful introductory book to the subject of paperweights and paperweight collecting. It includes a concise history of 19th and 20th century paperweights plus detailed coverage of many types of paperweights. An identification section is included. 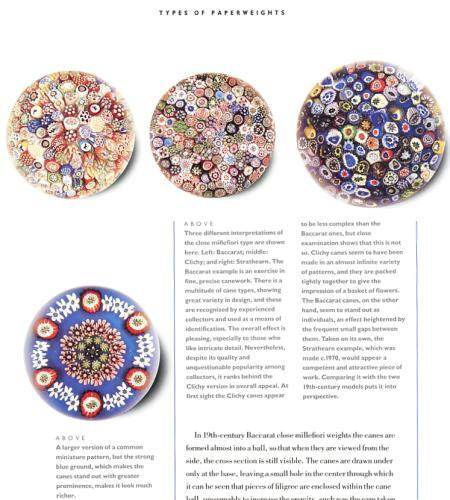 There is nice coverage of all the major categories, including millefiori, abstract, lampwork, dumps, sulfides, and others. One of the nice distinguishing characteristics of this book is the way that fine and "not so fine" paperweights are shown side by side. This includes the range from fine French antiques to modern Chinese and Murano weights. Click on the picture to see an example of such a page. 80 pages with many color pictures. Hard bound. 9 1/4" by 12 1/4". 1994.